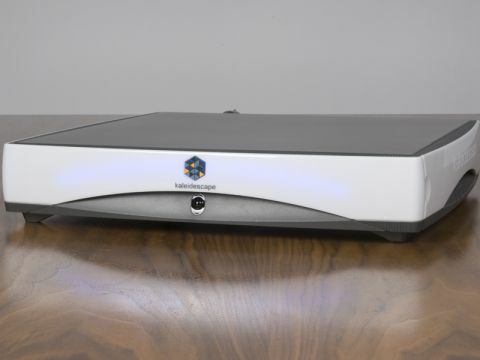 Does Kaleidescape's Mini succeed as an entry-level movie server? Kaleidescape's server/player systems offer a usability unmatched by building your own multimedia jukebox with inexpensive bits and pieces. No arcane gobbledegeek here – selecting a movie, song or complete album involves a system so intuitive even Big Brother contestants could use it. Among the metadata added by Kaleidescape are photos, cover art, title information and even reviews. CDs and DVDs are imported from the disc 'as-is' without compression. All menus and extras are retained, too, although you can jump straight to a movie. Exactly the same 'Kaleidescape Experience' underpins the brand's new entry-level product – the Mini – which contains both server and player in a solidly-built and tastefully backlit unit. Behind the Mini's front-panel drawbridge, you'll find a CD/DVD drive for importing or playing files. In this lowered state, the four drive bays are visible. Depending on configuration, up to 225 DVDs, 2500 CDs or a mix of the two can be accommodated. Based around 2.5in drives, the onboard server employs Kaleidescape's proprietary RAID-K technology. If a drive fails, your collection need not be lost. The Mini gives you the same AV connectivity options as the existing players, plus two independent audio zones. It can integrate with other Minis, players or Kaleidescape servers on your home network. Support for hi-def is minimal – no Blu-ray, for example. A hi-def demo film showcases its readiness for such formats, though, and looked very good indeed on Cineversum's BlackWing 1 projector. As did DVDs, with the caveat that all of my sample's pre-installed movies were R1/NTSC – and thus subject to the very slight motion judder introduced by the pull-down process. To be fair, little difference could be seen after I used the web interface to switch the HDMI output to 480i (thereby using the projector's own processing). This suggests the Mini's own video processing is to up to home cinema standards. In other respects, you get a wide contrast range allied to crisp detail and natural colour rendition – the presentation is akin to that of a high-end DVD player. Playback, both 'off-the-disc' and imported, of a PAL DVD proved excellent. And audio? Again, this was up to scratch. As expected, 5.1 movie soundtracks retained all the vigour of the DVD originals. CDs, auditioned via a stereo output, also fared well: I compared a Led Zep installed album on the Mini with my own CD, played via an Arcam deck. Any differences between the two were minimal. The Kaleidescape Mini is a unique proposition. It's expensive, but far more affordable than the company's previous products. It can work on a self-contained basis, and can be installed in minutes. The server concept means you spend less time looking for movies or music, and more time enjoying them.